Music theory can be a broad term. What we are concerned with here is Guitar Music Theory. This is the music theory that pertains directly to the guitar and guitar playing. Although much of music theory is universal such as the evolved convention of modern "staff notation" much of it is not. Many things are instrument specific and therefore not universal. This will include tabulated forms of graphic notations... like guitar tablature (or "tab" for short) as well as MIDI representations from software and other graphic or visual systems. Most certainly the technique of physically playing any instrument will have it's surrounding jargon and philosophy of approaches which will likely vary between the schools of thought and the genre and style being participated in. This is where the guitar theory comes into the picture. Besides the subject of the physical technique and its underlying theoretical reasoning, there is another very logical place to start our guitar music theory study and that is guitar tablature. If you are just starting out and want a gentle introduction start here. If you already understand tablature click here. 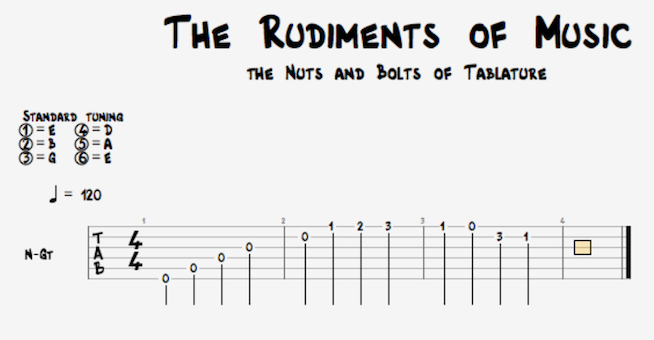 So Just What Exactly is Guitar Tablature? This is a system of musical notation that works for any fretted stringed instrument regardless of how many strings, how many frets or how it is tuned.There are horizontal lines that represent the strings of an instrument, six of them in the case of a standard guitar. There are then numbers placed directly on the lines to represent fret numbers. An "open" or un-fretted, un-stopped string is represented by a zero. The first fret wire available to "stop" the string vibrating its full length beyond the point of the nut (the little bar that sits in the join between the tuning keys and the fret board) is shown as a one. The second fret wire along making the string vibration length even shorter still is then shown with a two and so on up the neck making a string vibrate at shorter and shorter length and therefore at higher and higher pitch. The advantages with tablature are several. Firstly it is fairly instant and doesn't take a lot of training to understand and use. It shows a direct visual correlation of strings and frets. It gives exact finger positions. This eliminates the need to decide where and on what string to get a particular pitch to sound. Tablature makes possible scordaturas which allows the player to read and play music in other tunings without any mental or physical adjustments. Tablature can easily be represented using typewritten font by way of the ACII numbers (the American Standard Code for Information Interchange). This is now very widely used on the internet. Here is an example of ASCII Tab. The disadvantages are few but serious. Tablature gives an indication of finger positions but no indication of pitch itself. This is a big obstacle to analysing, absorbing and internalising music. It would be very hard to sight sing from tablature notation whereas standard notation allows the user to do this. This makes standard notation much better for understanding the art of harmony and music theory for composition, ear-training, improvising and general musicianship. Rhythmic information and part distinction is more difficult to convey with tablature. Many times there is no rhythmic information given at all. Tablature is instrument specific it applies only to (in our case) guitar music theory. This severely limits communication between players of different instruments. Again standard notation offers a universal platform between musicians of any instruments who are commonly trained to use it. Repertoire is limited to music written for or transcribed to tablature. In conclusion you can see that despite the advantages Tab is limited. It is a good place to start but my opinion is that standard staff notation is a good way to dig deeper into how things work in the long run. It all depends what your goals are. If understanding tablature is not a problem then let's take a look at some basic building blocks for guitar music theory that overlaps general, universal music theory. Great! It did Make Sense! If grasping the concept of "half steps" and "whole steps" makes sense you are further along on your journey than you realise. Have a look at the next episode The Accidentals: Sharps,Flats and Naturals relating to guitar music theory. If you felt stumped here do not worry... remember...If you can count to twelve and say the alphabet from A to G you can learn music theory! I can help you. I am sure of it. Just keep your eye on this site for more ideas.